On Thursday September 20, 2012 the Maryland Court of Special Appeals rendered a decision that resets the Jericho clock. The Maryland Court of Special Appeals reversed a lower court decision, which gave a summary judgment to the Six Unholy, Ungodly, Self-Appointed Rogue employees/members. These six rogue church members/employees were given control over the church board of trustees with that decision. The court reviewed an over whelming mountain of evidence that confirmed that Pastor Joel R. Peebles has in fact been a member of the Board of Trustees since 1997. The court also found merit in Chairman William Meadows assertion that his resignation from the Trustee Board was suspicious and probably will be disallowed because there was never a board meeting with proper notice given to the sitting board members. The Court of Appeals struck down the original incomprehensible and biased decision entered in the first trial by Judge Dwight Jackson. In no uncertain terms, the appellate court decision means that the summary judgment giving to the questionable board authority is no longer in effect and Pastor Joel Peebles is able to resume his duties. They are not considered the board. Anything that they put in place is considered null and void. This includes firing Pastor Joel, the excommunication of members etc. We will return to our building!! We will now receive a fair trial by a competent jury who will see the overwhelming evidence verifying that Pastor Joel Peebles has been a member on the Board of Trustees for years. 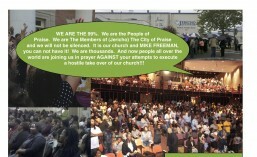 People of Praise, Don’t be fooled the by smoke and mirrors. The lawyer for the Unholy, Ungodly, Self-Appointed, Rogue employees has attempted to put their spin on this, hold on to something before you get dizzy. Their spin is that Get This! that they have won on two out of three actions from the Court of Appeals. ” Yesterday, the Court of Special Appeals of Maryland affirmed the decisions of the Circuit Court on two of the three issues it considered, and in favor of the Board of Trustees of Jericho Baptist Church Ministries (the “Church”). We look forward to resolving the one issue that has been sent back to the Circuit Court for resolution, which we anticipate will again support the conclusions of Judge Jackson’s earlier ruling. Here’s the Geico.com interpretation: The court of appeals takes a look to see if a mistake was made by a lower court. The court ruled that Judge Jackson made a mistake and that there is sufficient evidence to show that Pastor Joel was on the board. The other two issues were Judge Jackson not acting on all of the motions because they were duplications (the court found that they were and would not grant this) and requesting a summary judgement on our behalf ( the court would not grant this because it is not their role to decide the disputed facts of a case) Their job is to decide if a mistake was made and it was. As a consequence the ruling made by Judge Jackson that made these employees the legal board was reversed and a trial by jury will make the decision. These employees are no longer the legal board of trustees. This entry was tagged Apostle Fred Price, bishop rodney walker, bishop rs walker, Dr. Frederick K.C.Price, Dr. Mike and DeeDee Freeman, FICWFM, heritage church international, Isaac Marks, Jericho, jericho city of praise, Pastor Fred Price Jr. Crenshaw Christian Center, Pastor Mike Freeman, SOFCC, spirit of faith christian center. Bookmark the permalink. This is pew jumping news right here!!! How great is our God…All the world will see! The Bishop, Pastor Betty, Jamie and Johnnie are praising God for providing oversight over their Son and baby brother. What a MIGHTY GOD we serve! My prayers are with the City of Praise family.